Calculates and displays biorhythm graphs. 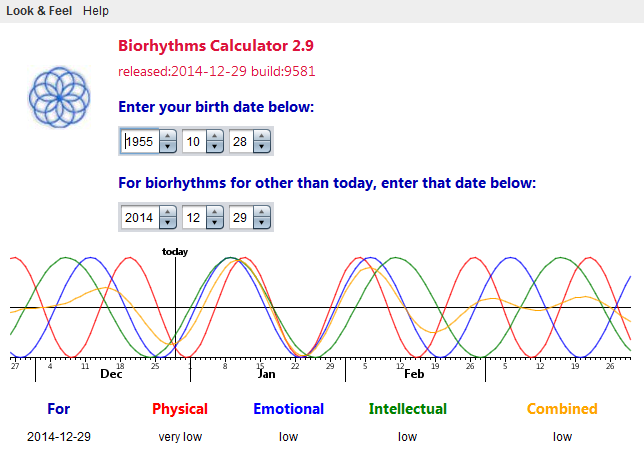 Enter your birthdate and this Applet and it will calculate your biorhythms. It computes your 23-day physical, 28-day emotional, 33-day intellectual and combined cycles. The combined cycle is sometimes called the luck cycle. The theory of biorhythms is when the cycles are positive/high you will have high energy. When they are negative/low you will have low energy. When they are zero or critical, you will have unstable energy. I can prepare you a customised version for a $25 fee. You need to send me three things: 1. What you want to see as the title, brand it with your name. 2. a 75x75 gif, jpg or png logo for the upper left corner. 3. a 75x75 gif, jpg or png logo to show on especially lucky days (optional) To install, Extract the zip download with WinZip, available from winzip.com (or similar unzip utility) into any directory you please, often C: -- ticking off the (user folder names) option. To run as an application, type: java -jar C:commindprodioio.jar adjusting as necessary to account for where the jar file is.